With the GoPro - Hero HD waterproof action camera, GoPro released a new entry-level action camera to the market. This camera does not have the abilities of the more premium GoPro cameras but can work well for most users who are not interested in 4K recording. In this article, we'll go in-depth in the features of the Hero HD and how it compares with the competition. What Is the GoPro - Hero HD Waterproof Action Camera? 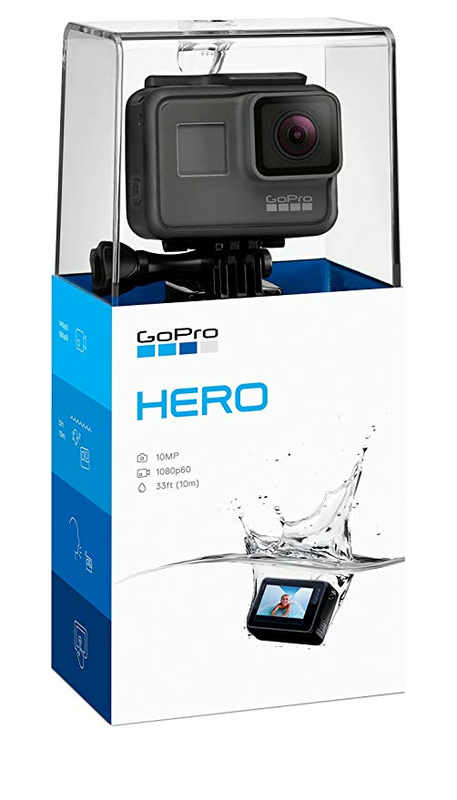 The GoPro - Hero HD Waterproof Action Camera is a basic full HD action camera released on March 29th, 2018. This camera builds on the features of the GoPro Hero5 Session although its body looks eerily similar to the premium Black and Silver models from GoPro. The GoPro Hero HD is ideal for many casual and even semi-pro users who don’t mind recording in 1080p. 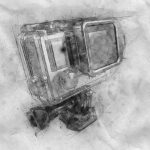 This camera was built in the shape of the other GoPro Icons like the Hero 6. The camera has a 2.0-inch touchscreen control interface on the rear. The GoPro - Hero HD Waterproof Action camera does not support 4K recording, a feature that has become a staple of action cameras in recent years. GoPro released this camera with this fact in mind, and they priced it accordingly. The camera can be linked to a smartphone through the QuikStories app, but GoPro's Voice Control feature can also control it. The camera has native image stabilization that evens out vibrations from video footage. One of the most outstanding features of this camera is that it is waterproof just like its more expensive cousins. Its waterproof qualities are effective to a depth of 10m without a case. The GoPro - Hero HD Waterproof Action Camera is also good a covering sports events as evidenced by its 170-degree field of view. The camera has two buttons that and other controls are through its stripped-down UI. Unlike more premium action cameras from GoPro, this camera does not have an LCD interface for viewing replays. This camera is powered by a 1100mAh, 3.7-volt battery which, according to GoPro, can record for over 2.5 hours regardless of the video resolution. This camera suffers in still image shooting and can only take shots at 5MP. The GoPro was released at a price of $199, but its price has since fallen a bit. You can currently find it on Amazon for about $180. You can also buy this camera on Walmart, B&H, and other online stores. 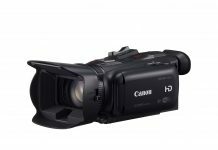 The Canon Vixia HF R800 1080p camcorder is a 2.1 x 2.3 x 4.6-inch, 310g, dual flash HD device. Its physical appearance is reminiscent of older Canon camcorders, and it has the battery pack sticking out at the rear. The camera is built on a Digic DV4 processor infrastructure. It has a 3.28 MP CMOS sensor and audio is via a Dolby digital 2-channel system. Equipped with a lens that can zoom up to 32X, this camera is better than the Canon Elura 100 in that respect. You can also increase the zoom even further to 57X in In advanced mode. 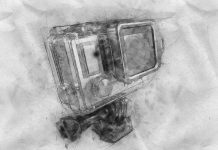 The HF R800 has impressive optical image stabilization, cinema-look filters, and the ability to record video at frame rates of up to 60fps. This camera records MP4-format video at 35mpbs. This Vixia model camera starts up fast, and you can turn it on by just opening the LCD. The HF R800 has a Pre-REC function that records starting from the previous three seconds. The camera has a 3.0-inch touchscreen, 230,000-pixel rotating LCD, plus both slow-motion and fast-motion recording. In the still image department, this camera’s 2MP 1/4.875-inch CMOS image sensor takes more detailed photos than the Canon Elura 100. That said, the photos are not as detailed as those taken by the Sony or GoPro models below, so be sure to read on if that is a key feature for you. The HF R800 has an external mic jack and a mini-HDMI port in addition to the output ports available on the Canon Elura 100. This camera is sold for about $180 on Amazon. The GoPro - Hero HD Waterproof Action camera’s UI is pretty basic, but it is, by all means, very easy to use. However, the absence of an LCD for viewing replays makes it limited in this regard. The camera is waterproof without a case, a feature that can enable users to use it with confidence in the outdoors. The Hero HD is a high performer with several useful functions. The camera can record at up to 60 fps in 1080p, and its videos look quite good. The camera has an excellent 170-degree field of vision which is important in some outdoor sports. The still photo shooting abilities of this camera as are not as good as its video and because its sensor is shots at a maximum of 5MP. This GoPro Hero HD has a very good 1100mAh battery which will power it for over two and a half hours. The sound quality by this camera is acceptable for most outdoor sports. GoPro imported features from its premium cameras to this camera giving it a rugged but portable feel. The camera comes with native waterproof abilities to a depth of 10m. GoPro also makes this camera versatile by giving it a number of mounts for connecting to a helmet, car roll bar, wrist, bicycle, car surface, ski/ snowboard, and more. The GoPro Hero HD is covered by a one-two-year warranty depending on where you buy it. The Sony HDR-AS50 is tiny a full HD action camera that weighs just 83g. Like the GoPro Hero HD, this camera can record at 1080p in different frame rates, the maximum being 60 fps. The camera produces more detailed 11MP photos than the Hero HD. This camera has several recording modes including Loop, Burst, Time-Lapse, Motion Short, and Live Stream. You can connect the Sony HDR-AS50 to other gadgets using Bluetooth and Wi-Fi. This camera also has SteadyShot Electronic Image stabilization and a small LCD screen for changing settings. The camera has a good battery which can fire it up for about two-and-a-half hours when recording. Attachments which come with this camera include a waterproof case that is functional up to 60m. You can buy a live view remote if you desire. This camera can be obtained at Amazon for about $170. This camera’s design seems well thought out. The camera has an LCD screen for camera settings. You can also connect a phone and operate or monitor this device using the Sony PlayMemories app. This camera can also be operated by Sony’s Live View Remote which can be bought separately. The Sony HDR-AS50 records good quality 1080p video up to 60 fps, and its 60fps video is acceptable to some. The phone’s 11MP photos are also quite good. 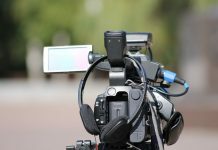 The camera has a number of recording modes including Time-Lapse, Motion Shot, Burst, Loop, and Live Stream. This camera is equipped with SteadyShot Electronic Image Stabilization System to smooth out video footage when recording in rough terrains. The battery of this camera is on a par with that of the GoPro Hero HD and can support this camera through two and a half hours of recording. One of the most noticeable features on this camera is its small size. This 83x47x24mm camera weighs just 83g without the waterproof case. The camera was built in Sony’s trademark triangular shape. This camera looks pretty solid and reliable. A one-year warranty covers this Sony camera. The Yi 4K+ action camera is the easy winner on our list when it comes to video quality. This camera can capture incredible 4K videos at frame rates of up to 60 fps. In HD, this camera will capture video at up to 120fps. The camera also records in 720p at frame rates of up to 240 fps. The Yi 4K+ 12MP still images are also very detailed and users have the option to shooting in RAW format. The battery of the Yi 4K+ is not as good as that of the GoPro Hero HD or the Sony HDR-AS50. Expect about 2 hours of video recording with the Yi 4K+ camera. This camera can be obtained at Amazon at about $220. This camera doesn’t come with the bells and whistles that come with premium other 4K action cameras. This limitation has the advantage that the camera is easy to use. At just 93g, this camera is relatively light and easy to hold. The Yi 4K+ also has a very easy-to-use user interface that even some toddlers can master. This camera can also be operated using voice. Transferring your videos and photos is also easy, and you can effect the transfer via a mobile app. This camera also has electronic image stabilization but this only functions when recording at 4K at 30 fps. One area where we found the Yi K+ wanting is the absence of sensors like the GPS, accelerometer, compass, and other such sensors. 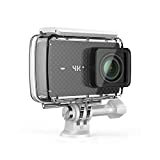 It is quickly apparent when viewing video recorded by the Yi 4K+ that this camera is in a different class compared to the GoPro - Hero HD Waterproof Action Camera and the Sony HDR-AS50. This camera records at up 60fps at 4K like. Its 1080p videos are even more impressive, and you can set frame rates of up to 120fps. Although the battery life of the Yi 4K+ is not impressive, you will usually squeeze out about two hours of recording out of its 1400mAh battery unless you are recording in 4K, in which case, you will get slightly over an hour. The Yi 4K+ camera is a beautiful rectangular gadget with a sleek checkerboard pattern at the front. Yi made efforts to keep this camera lean. At 93g, the Yi 4K+ is very easy to tote around. This camera has a big 2.19-inch touchscreen color interface that maintains good colors and sharpness even when viewed at steep angles. This touchscreen interface is one of the most responsive touchscreen interfaces of any action camera. One area in which the GoPro - Hero HD Waterproof Action Camera beats this camera is the performance in wet conditions. While the Hero HD is waterproof, the Yi is not. The Yi 4K+ is covered by a one-year warranty. The Ion Air Pro 2 camera is a decent Wi-Fi enabled action camera which comes with native waterproof abilities. Although videos recorded by the Ion Air Pro 2 (1080 up to 25fps) are not as detailed as the ones of the Sony HDR-AS50 or the GoPro - Hero HD Waterproof Action Camera, they should be acceptable to most casual users. The camera makes up for its deficiencies in the video department with its still photos. This camera produces 14MP (up to 4,608 x3,456) shots, the most detailed of any camera on our list. The camera has a PODZ system that allows the mounting of different accessories. The Ion Air Pro 2 has a MicroSD slot, Mini HDMI port, and 2.5-inch mini mic jack. Like the GoPro Hero HD, this camera is waterproof up to 10m. This camera can be hooked to a smartphone through Wi-Fi. In fact, most of its settings can only be changed using the app. This camera can be bought for about $150 on Amazon. It becomes clear when you look at the Ion Air Pro 2 that its designers are obsessed with ease of use. You can start and stop recording by merely flicking a switch on top of the camera. The camera also has a dedicated still image button for still shots. This camera tucks away most settings in its mobile app, to which you can connect to using Wi-Fi. 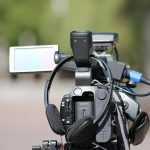 Although this camera’s 25 fps full HD video recording abilities are not the best from an HD camera, it video recording abilities are quite acceptable to many casual users. The battery can easily power this camera for two-and-a-half hours unless you activate Wi-Fi. Unlike GoPro and Sony cameras, this camera has a unique bullet format that makes it look like a flashlight. You can have easy access to its recording and photo shooting buttons on top of the camera. The camera looks solid and reliable. This camera is covered by a one-year warranty. The GoPro Hero HD is a fine action camera with native waterproof abilities up to a depth of 10m. This camera can record at 1080p at frame rates of up to 60fps. It comes with several features that we have come to expect from a GoPro. These include native image stabilization, voice control, app synchronization, and solid battery performance. The only area in which this camera is disappointing is the quality of its still image sensor. The 5MP photos are only useful to casual users who want to post on social media. We would recommend this camera to semi-pro and casual outdoor gaming enthusiasts, and we give it a score of 4 out of 5 stars. If the 4K recording is a must, consider buying the 4K, 60fps Yi 4K+ action camera. But this camera is not waterproof and costs about $50 more than the GoPro - Hero HD Waterproof Action camera and the Sony HDR-AS50. The GoPro Hero HD is a native waterproof ability and 170-degree field of vision, However lack of 4K recording ability. Next articleGopro vs Sony Comparisons – Which is Better in the World of Cameras?